Welcome to Eleven Gables "Blogger Stylin' Home Tours, Fall 2014" edition! If you are here from Retro Ranch Reno, I am so excited to have you! Thank you, to the darling Lindsay of The White Buffalo Styling Co., for inviting me to be a part of this fun tour. 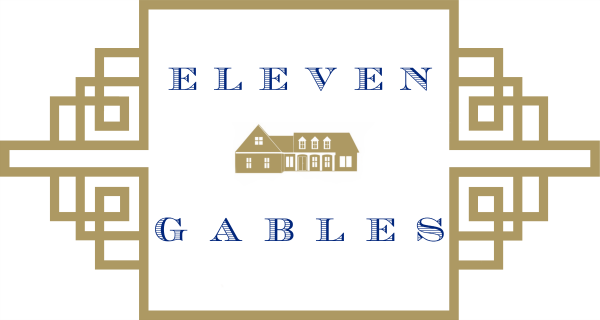 This is our home, Eleven Gables. We recently just endured a 16 month overhaul of the entire kitchen, laundry room/butler's pantry, porch, and exterior. If you haven't seen those rooms, YOU MUST! Our home is nestled in a quiet little community in Oklahoma. 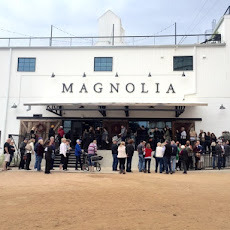 It is filled with thrifted finds, antiques, hand-me-downs, DIY's, and craigslist scores. As my favorite decorator, Charles Faudree, would say: It's all about the mix. I share our home in hopes that it will inspire you in one way or another. If you drop by unexpectedly, I guarantee you it will not look like the pictures. What you will see is a family enjoying life and living. There will be socks on the floor and handprints on the wall and I can assure you that you will have to step over or move something at least once to get where you are going. We are so grateful for our home. Our prayer is that it blesses those who enter. I typically scatter white, ghost pumpkins throughout the landscape. It is still in the upper 80's, lower 90's for the temps here in Oklahoma and my pumpkin supplier (a.k.a. the cheapest place in town) hasn't received his shipment yet. So, I am going to warm up the interior with some Fall decor and invite you in for a little peek! You all, these topiaries are FAUX! I was so sick of buying new ones every year only for them to die or half-die. I finally invested in these and I LOVE them!! A french basket filled with wheat and burning bush stems hangs on the door. This pumpkin was an offspring of last year's pumpkins that were set out in the field by my home. 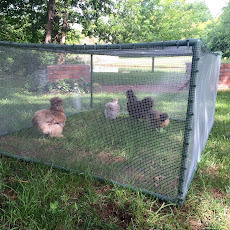 We leave them there for the various critters to munch on during the winter months. Cut and dried hydrangea from the landscape stays so pretty during the bleak winter months. I recovered this lampshade and added greek key trim on the inside for a fun surprise. I used a tutorial from pinterest. This pheasant comes out every Fall to grace my table. My Dad is an avid hunter and gave this pheasant to my Grandma years ago. When I got married, she gave it to me for my home. On the off season, I let my son keep it in his room. I keep contemplating painting this cabinet, but really, I am just hunting for the perfect french sideboard. Pine cones, Antlers, Wheat, and Maples... a typical Oklahoma Fall! Pumpkin Spice Marshmallows.... need I say more? I always wanted a bundle of wheat like this, so this year I made my own. It was painstaking to remove all the little spiky wisps from the ends, but I conquered it during various soccer practices. This is four bundles of wheat from Hobby Lobby with the ends removed. Preserved maple leaves add a touch of color while I wait patiently for our maples to change color. The burlap pumpkins are from Target this year! A butler's tray makes the perfect drink station for yummy cocktails! Come back when the weather cools and I will share our delicious go-to beverage for a chilly Fall day. Fall is a perfect season to leave the french doors open and enjoy the gorgeous weather! I love the beautiful aspect of using feathers to decorate with in the Fall. These have been in my collection for almost 20 years. Trays help gather my arrangements. Tucking a pumpkin here and there helps bring Fall into our home. White mums tucked in a blue and white foot bath are a quick and easy centerpiece. My mom, the hostess with the mostest, taught me this trick as a young girl. She always tucked annuals into various containers for wedding or baby showers held in her home. After the shower, she would pop the plant into the landscape. This is such an easy, inexpensive solution for a quick centerpiece! Adding gold to my coasters was inspired by my friend, Kristin, over at Bliss At Home. I DIY'd my own agate coasters using THIS tutorial! It was so easy! Thank you for joining me in this tour! Come back soon and I'll show you some peeks of Halloween here at Eleven Gables and on Instagram. To see what we are up to day-to-day, follow me here on Instagram! 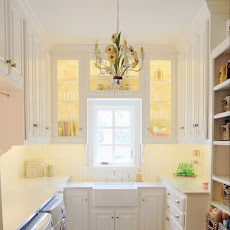 Next up on the tour is the fabulous Sarah M. Dorsey Designs. I love to share my resources with my readers! Affiliate links are occasionally used in my posts. every time i see your home i fall a little more in love- it's idyllic! just so beautiful and so stylish!! Thank you, sweet friend. How fun would it be to hang out and read blogs together in the morning? Have a happy day!! Emily, your home is lovely! I can't wait to see it in person ;). I'm curious as to who is the cheapest in town for pumpkins??? Emily, your home is so very elegant, yet totally comfortable and approachable. I love every well-thought out detail. YOUR LAMPSHADE! Love it! And your living room makes my heart go pitter pat... maybe I'll have a grown-up living room some day. Beautiful job, friend! Beautiful....that pinecone bowl is gorgeous!!!! Emily - I found you from Kim's Savvy Southern Style blog where you were featured. Wow is your home ever amazing - it's AWESOME! I love your style - and your wonderful attitude of humbleness, too. I am your newest follower, and it is a pleasure to be so! I am looking forward to visiting other home tours for the autumn touring - and looking back to your older posts as time allows. Everything is gorgeous! I so want your covered outdoor space, wait I think I've said that before! Wow! I'm blown away every time I see more of your house. Still love your porch the most but the front door and entry is a close second! AND those vaulted ceilings! Love! It's all about the mix indeed, friend, and you mix it WELL! So SO pretty!!!! Your home is beautiful and elegant - but cozy too! Its perfect for fall! Emily, it is just breathtaking and beautiful!!! What I love about your home is that it says welcome from the moment you enter your driveway. It is the kind of home that embraces you and makes you want to stay awhile! Your decorating is out of this world! You truly have created a haven! My favorite home!!! You have such a gorgeous home! I'm in love with your covered porch! Thank you for the lovely tour! I've heard a couple of artists saying that while they enjoy being asked for autograph, they always prefers to be treated like the ordinary people they are. Emily, I loved your house tour and seeing rooms in your house I've never seen before. You have such a gorgeous home and I love all of your fall touches!! What a wonderful tour! Everything is just beautiful and has such a collected feel:-) Thanks for stopping by Far Above Rubies!! your home is amazing. I saw your outdoor porch last weeks on Savvy southern and wanted to come back to say hello. Happy Fall! Your home is so beautiful! I bet your back porch is delightful during this time of year! Emily, the architecture of your home is so lovely! Beautiful curb appeal, front entrance, wrought iron staircase - and so many pretty details that you've added to make it your own home. I loved taking the tour, thank you for sharing it! Your patio is still my favorite space of yours, I would absolutely live out there!! I would love if you come link up tomorrow on the Monday party! Your house was FANTASTIC!!! Don’t you know that you can earn extra money because of your beautiful and amazing house? Your house has the ability to be a house for filming. There are lots of filmmakers are looking for an amazing place to shoot their movie. You can list your house at http://lightsonlocation.com to expose it from lots of filmmakers out there. Grab the opportunity and earn some money! Listing your property are absolutely free.! Hi I know this is out of the blue but I stumbled upon this via pinterest. Your butler table interests me as I have the exact same one. I purchased it at a yard sale a few years back and wonder if you know anything about it? Love your blog btw.